Ralph Cahoon’s “Barnstable Great Marsh Saltworks 1880,” was probably his last completed work in 1981, according to his son Franz Cahoon. 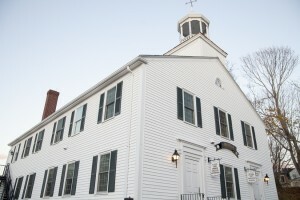 COTUIT – The Cahoon Museum of American Art in Cotuit recently completed a renovation and addition and will be opening to the public next month with a new exhibit and a series of talks. “Coming Home: Works by Ralph and Martha Cahoon” will be the inaugural exhibit in the museum’s new gallery and showcases more than 50 seldom seen paintings and furniture from the artists’ private collections. The exhibit opens Sunday, May 8. Several programs have also been scheduled to enhance the new exhibit. Guest Curator Cindy Nickerson is a Cahoon scholar and will give a talk on the exhibit on Tuesday, May 17 at 11 a.m.
“The Art of Restoring Paintings and Frames” from Ron Lindholm and Tracey Nee will be held on Tuesday, May 24 at 7 p.m.
Conservator Barret Keating has restored about three dozen pieces of furniture decorated by Ralph and Martha and will talk about his work on Thursday, June 2 at 7 p.m. The last talk will feature Auctioneer Joshua Eldred who will speak about selling the works of the Cahoons. It will be held Tuesday, June 7 at 11 a.m.
All programs run about an hour and are included with museum admission.